Yes, that title is a very deliberate pun. 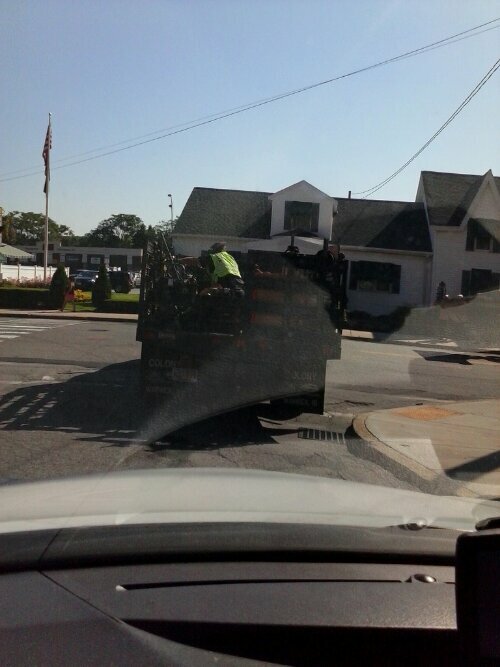 Here I was, this morning, driving through the center of Woburn after dropping off the kids at daycare, when I saw a cop – yes, a bonafide Woburn city policeman – hitching a ride on the back of a construction truck. That’s something you don’t see everyday. I have to say that after nearly a year here in Massachusetts, I’ve found cops to be a somewhat different breed than their peers in Vancouver. More relaxed isn’t the right term, but I do find them a little more easy as they go about their business, not quite standoffish like they are in Vancouver. And, weirdly, less intimidating, if not more glum faced and serious looking. But their ease of being with the community is on display here. You’ll never find a cop hitching a ride on the back of a construction truck in Vancouver, that’s for sure.